What is Dig It! 2015? There is already a lot planned for next year and we are compiling an exciting programme of events drawn from a whole range of organisations (we are taking a very holistic approach to what is considered ‘archaeology’!). 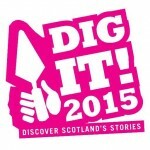 We want as many people as possible to find out about archaeology and to contribute to the big story of Scotland’s past. This is a past and story which belongs to all of us, and the events and programmes which run through the year will provide people with a range of activities from theatre performances to exhibitions, open days and discovery sessions, so that as wide a range of Scotland’s population can get involved. We are especially looking for events that actively involve 16-24 year olds, whether that’s those who are in school, college or university or a local youth or scout group. This part of the programme is still in development, so we are looking for ideas, as well as organisations and groups who want to be involved. You might have an idea about putting on an archaeology activity or you might just want to be kept informed of events in your area where you could go along and find out more. We are especially keen to get people out to actually visit sites and places of historical/archaeological interest, and to take some time to explore the heritage around them. Whatever your interest, if you would like to be involved, then please take a look at our website www.digit2015.com for more information get in touch with your ideas! Working FOR teens and WITH teens internationally.